Hot stocks to watch: A spate of earnings reports from key industry players triggered mixed markets today (Thursday). Two high-profile tech companies slumped after missing Wall Street estimates. But, a couple of investment banks, a beverage giant, and a gourmet burrito chain all reported better-than-expected numbers and moved higher. 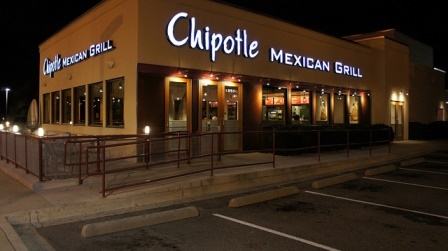 Chipotle Mexican Grill (NYSE: CMG) shares were up $28.10, or 5%, to $580 Thursday morning on strong Q1 results – but then dipped by more than 4.5% in the afternoon. The company posted earnings per share (EPS) of $2.64, up 7.8% year over year, yet shy of the $2.88 analysts were expecting. But, net income grew 8.5% to $83.1 million. And, revenue increased 24.4% to $904.2 million, better than the $873 million expected, according to FactSet. The fast-casual restaurant chain attributed the revenue rise to a 13.4% jump in same-store sales. The company said comparable sales are projected to rise in the "high single digits" in FY2014. Buoyed by speedier transaction times, expansion, and more marketing, EPS are expected to grow a sizzling 54% over the next two years. Goldman Sachs Group Inc. (NYSE: GS) shares gained 2% to $161.46 after handily beating analysts' estimates. The investment bank reported Q1 EPS of $4.02, down 10% year over year. But, that was comfortably better than the EPS of $3.48 forecast. Revenue slipped 8% to $9.33 billion, compared to $10.09 billon year over year, yet was also better than the $8.66 expected. Investment banking revenue grew 13% to $1.78 billion, from $1.57 billion a year ago. Fixed-income revenues, meanwhile, where down 11% to $2.85 billion, from $3.22 billion a year earlier. That was, however, up 65% from Q4. Employee headcount grew to 32,600, from 32,000 a year ago. Google Inc. (Nasdaq: GOOG, GOOGL) shares fell about 3% to around $540 in mid-morning trading Thursday after delivering Q1 earnings after Wednesday's close that missed on both earnings and revenue. The world's largest Internet search provider reported Q1 revenue of $15.4 billion, up 19% from $12.95 billion a year ago, yet short of the $15.54 billion analysts had expected. EPS came in at $6.27, below the $6.44 per share analysts were expecting. Google's cost-per-click, the average price it charges advertisers, declined 9%. Paid-click growth increased 26%, but it has historically been up about 30% in good quarters. On a positive note, the company said Tuesday's one-day sale of its $1,500 Google Glass sold "really fast." R.W. Baird & Co, with an "Outperform" on the stock, called the Q1 performance a "very slight miss." Speaking of Google's investment ventures, Baird said "Google invests early and innovates early." Indeed, R&D spending jumped 31% year over year. Before the earnings reports, Google shares had surged 27% over the past six months and were priced for perfection.